Do you love those cheesy movies from the 80s? Then get ready to behold the hilarious madness of Kung Fury by Laser Unicorn. 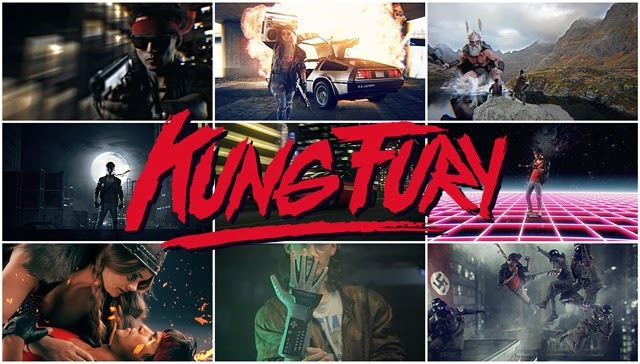 Here's how they describe the film: "KUNG FURY is an over-the-top action comedy written and directed by David Sandberg. The movie features: arcade-robots, dinosaurs, Nazis, vikings, Norse gods, mutants and a super kung fu-cop called Kung Fury, all wrapped up in an 80s style action packed adventure." They have a Kickstarter campaign to raise $1,000,000 to make a feature film. Id say its madness except they're last fund-raising campaign got them $400,000 which is twice what they were looking for. Thanks to Nisse for the tip! If you have a tip then send it to us at geektwins (@) gmail (dot) com. That was cheesy all right! They pulled no punches with the violence. I am happy to be able to spread this pure awesomeness to anyone who may enjoy it! Personally I'm in with $100; I want - nay neeeeeed - that blue-ray :). It is interesting how they started out with a goal of $200,000 and now is over a million.If I remember correctly, it went up on Dec 26, and has spread this far already. Just proves how far you can get with wacky, crazy stuff as long as it appeals to nerds! Love the Green Screens at the end! That has too much 80s-goodness!!! My brain is trying to wrap itself around what I have just seen.